Business as usual – run, pool, breakfast. 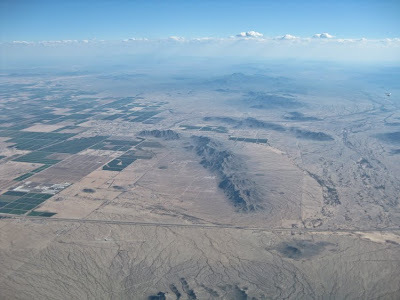 They call a 78 mile box like task that will take us quite a way out into the mostly roadless desert, but we’ll be in proximity of the mountains. It’s forecasted to be a good day. I’m a little skittish about the light conditions when launch opened yesterday, so I wait for half a dozen flexies to tow up before I launch myself. Light lift has us all congregating before the start. We’re not getting high and everyone is bunched up north of the resort. The start times begin ticking over and no one is interested in going. Probably 3/4 of the field is in one thermal. The switch never turns on. We’re only topping out at 5500ft. Dustin, lower right, and I going into orbit. Everyone finally bails on the third start. It’s slow, conservative going the first and second legs over the flats. Many are gaggled up just trying to survive. As we near the desert, things do get better and I think we get near 8000ft. 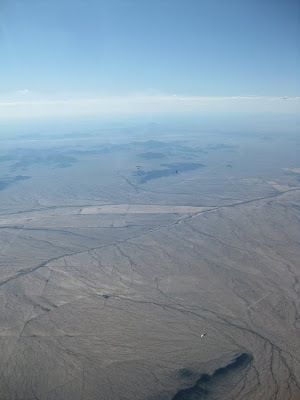 close to the sailplane port on the border of roadless land. Bunner sees a sailplane flying around inverted. We spot him flopping right side up and upside down. 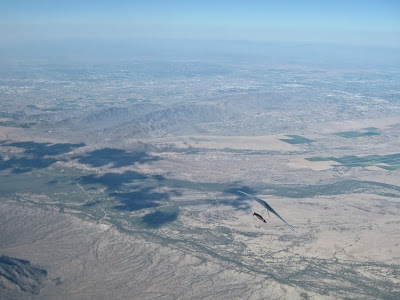 Apparently there’s a hot US aero sailplane pilot based out of Estrella. 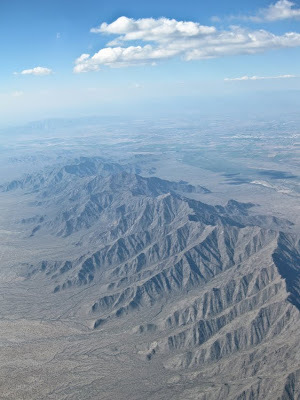 The view of the big range from 14,000ft. There are clouds @ 16 or 17,000ft. over the big mountain range and Dustin sees a wispy developing over the south end close to us. He heads for the big ridge and I join him. We’re rewarded with 800fpm up, and up, and up. Around 10,000ft. I realize we’re going to get high and cold. Suddenly I hear Dustin on the radio, “HEY, Look, Look, the fighters to the west!” There are two fighter planes making contrails as they dump copious amounts of fuel diving out of the sky. They’re heading RIGHT for our gaggle. The view from where we came. 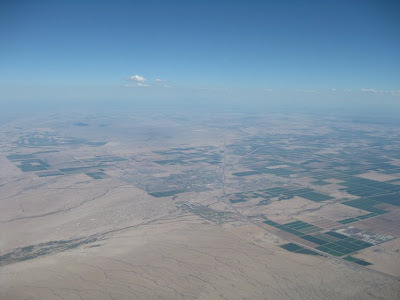 Agriculture turning to desert. I watch them approach, still dumping fuel and try to figure out if anyone will get hit. They pass directly underneath me between the group that is high and the group that is low in the thermal. It’s unbelievable no one gets hit and I’m sure they didn’t see us blazing along at 400mph. We top out at 14,200ft. still going up, but I’m getting pretty cold and decide to head out. I head straight for the turnpoint 20+km in the distance over the valley. I get a good glide while Dustin runs the range and gets to 15,500ft. He’s behind a few km now, but I’m thinking he’s got position on me. The area out by the turnpoint looks really desolate and I’m glad everyone is high enough to make it out and back to civilization. Mitch and I take a long glide right back to the south end of the big range where we’d climbed before. The cloud is still there and we pull into good lift at around 10k. We enjoy smooth lift right up to 15,000ft. before pulling out and heading on course. I’ve got 12.2 to 1 to goal. It’s over 30 miles away and around one more turnpoint. It’s amazing to me we can tow out of 100 degree oppressive heat and rise almost three miles above the ground until we’re freezing. I can feel my heart beating hard in my harness and a couple of people sound like they’ve got a touch of hypoxia on the radio. My hands turn wooden around the basetube and soon I’ve got full body shakes vibrating through the control frame into the wing. Who gives a sh*t though. We’re in orbit and might have glide from 30 miles out. looking SE toward home. Twenty miles to a turnpoint, then 10+ miles home. My numbers stay the same for 30 minutes. As I round the turnpoint, I can hear those on the radio behind me starting to struggle. They hadn’t gotten as high in the last climb. I’m just gliding, and gliding, and gliding not hitting a blip of lift with a 12 to 1 still. Finally about 8km from goal, I hit buoyant hot air which carries me along. Numbers start getting better but I still fly conservatively. After the dramatic flight, I don’t want to hit sink and land short. I burble in with just enough altitude to have a dive at the roof of the hotel where 10 spectators are congregated. Turn around and land… Unbelievable final. For many including me, it’s one of the longest glides they’ve ever had. Airtime: 4:50. Flights: 1. MIles: 78.